1 skin conditions | This Blog Rules | Why go elsewhere? This condition presents with facial erythema (redness) and may present with or without pimples. It commonly begins across the cheeks, nose or forehead but can spread to the ears, scalp, neck or chest. Although sun exposure and emotional stress are common factors implicated in its appearance, rosacea is often caused by cold weather, humidity and wind so winter presents and ideal set of circumstances for it to flare up. A visit to a dermatologist can ease symptoms and treat the ailment in no time with local antibiotics, retinoid creams, laser therapy or other types of treatment but prevention is essential if you know you have sensitive skin. Proper protection is paramount- a scarf and maybe a hoodie can do wonders. Also make sure to wear sun-block as snow reflects significant amounts of UV light and makes you that much more susceptible. This common immune-mediated skin ailment affects 2-4% of the general population and presents with scaly itchy patches on the superficial layer of the skin that have a silvery-white appearance. Patches are most commonly found on the elbows, knees, scalp or lower back and appear more commonly with season and climate changes, stress and obesity. The reason flare-ups occur more often in winter is the decreased UV exposure (that slows skin-cell growth down) so that you can consider dermatological treatment with home light units (UVB light) that is shown to ease symptoms. While corticosteroids work, you need to use them with caution as the “corticosteroid rebound” effect may aggravate symptoms. In contrast to psoriasis, the typical legions in eczema are usually found on the inner side of joints and are also itchy, erythematous and crusting. Other symptoms include swelling, dryness, crusting, flaking, cracking, bleeding, blistering or oozing and scratching often enlarges the rash. Eczema is more often in patients that also present with allergies or asthma and symptoms are worsened when temperature and humidity levels decrease. Preventive measures are always welcome and they involve moisturizing, wearing gloves, protecting the face and ears from extreme temperatures and even considering a home humidifier. Antihistamines or topical corticosteroids are recommendable especially if patients are particularly prone to scratching. Most of us deal with chapped lips during winter and as insignificant as it may seem, it is extremely stressful and painful. It presents as a severe inflammation of one or both corners of the moth. 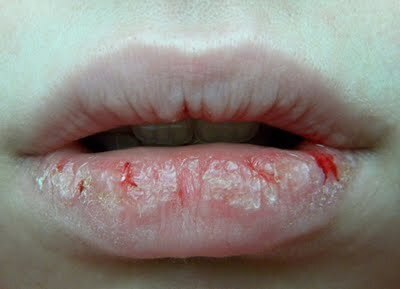 Superficial lesions are not nearly as uncomfortable as deeper ones, which can range from cracked lips to bleeding and although such symptoms can also indicate other issues (such as vitamin A, D or B deficiency or fungal infections) it is most commonly an opportunistic infection with bacteria that occurs in winter months. Treatment hast to be centered on the exact cause of the problem and while your everyday cracked lip could benefit from simple chapsticks, such conditions often require antibiotic or antifungal creams.